Oh, don’t worry, I get it….most likely if you’re reading the Wilmington Journal, you didn’t vote for Trump back in 2016, ‘cause you knew what was coming. That is, if you voted for president in 2016. It is all such a bad memory now. That crazy rich man who kept making up stuff so that folks wouldn’t pay attention to what he was really doing, namely getting us into wars and conflicts he had no business getting us into. Boy was the Donald surprised to realize that Kim-Jong-un, the Supreme Leader of North Korea, is crazier than Trump was, and actually meant what he said when Kim promised to send a missile to Mar–a-Largo, Trump’s Florida retreat. Luckily the US intercepted the thing, so Trump still had someplace to play golf while the Congress was investigating him for impeachment. Afterall, Trump had to know that sooner or later, those videos of him from that Russian hotel he stayed at during that 2005 business trip were going to see the light of day. It’s just a shame (for him, at least) that those videos were released right before he announced that he was going to run for re-election. Boy, I would have loved to see him try that “Make America Great Again” garbage again, especially with unemployment zooming sky high on his watch; inflation hitting at double-digits; the crime rate tripled; civil rights violations all over the place, and even Republicans filling the streets in protest because no one could get decent health care anymore. All of that was ten years ago in 2017, when Pres. Trump was high on the hog…for a short while anyway. I mean, it is still truly amazing that as many Americans bought his “strong leader” act as they did. After all, the man lied and lied and lied like falling rain back then, no matter how many congressional hearings they had. And no amount of threats to take his Twitter account away stopped him from giving federal investigators all the evidence they needed to for Democrats to start impeachment proceedings against him in 2019. Yes, it was certainly glorious when the Dems took back the Congress – both houses. It took them a long time, but they finally found their mettle after being pushed around and profoundly disrespected after so many years. But at least they were able to reverse some of the damage done by Trump and the Republicans in the previous Congress. Now, more Americans have affordable health care than ever before, Meals on Wheels has been up and delivering food to the elderly and needy again for the past several years, and it took seven nominees to replace Attorney General Jeff Sessions after he was forced to step down, but at least he was somebody who cared about civil rights and religious liberties. Muslims and Mexicans can breathe easier once again. It is a shame, however, that years after that blasted wall at the Mexican border was finished, Pres. Trump finally admitted that he always knew that Mexico would never pay for it. Yep, the Donald Trump era was ten years ago. Here’s hoping that we never make that mistake again. But let’s all get behind Pres. Obama, and give her all the love and support she deserves. I, for one, am glad that she got so sick of watching Trump and his foolish-ness, that she changed he mind, and with the support of her husband and family, decided to run in 2020 and defeat Pres. Mike Pence, who had to take over when Trump was drummed out of office. Folks really got fed up with his “good ole’ boy” act, and limp excuses that he really didn’t know what was going on in the Trump White House. So now Pres. Michelle Obama has finished her first term, and going on to her second. Her husband is on the United States Supreme Court, and her oldest daughter is a senator from Illinois. The year is 2027, and all is right with the world once again. (TriceEdneyWire.com) - Chuck Berry, who died Saturday, March 18, was held in such high esteem as the father of rock n roll that rock royalty often played backup in his bands. At Berry’s 60th birthday celebration in St. Louis, Eric Clapton, and Keith Richards of the Rolling Stones, huge stars in their own right, backed Berry as he sang and duck walked across the stage while the audience danced in the aisles or in their seats. The 90 year-old Berry died Saturday at his home in St. Charles, Mo. 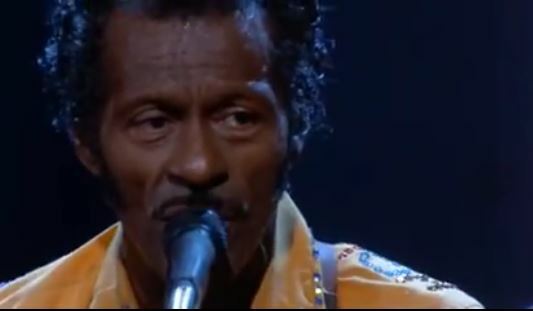 “We are deeply saddened to announce that Chuck Berry, beloved father, grandfather and great-grandfather, passed away at his home today (Saturday) at the age of 90. Though his health had deteriorated recently, he spent his last days at home surrounded by the love of his family and friends,” according to his website. On October 18th, his 90th birthday was supposed to be a celebration. He said he would release in 2017 his first album in 38 years. The album consists of new songs he had written and produced. He planned to dedicate the album to Thelmetta, his wife of 68 years. The release date for the new album, simply titled “Chuck,” has not yet been announced. A signature guitarist and a prolific songwriter, Berry wrote songs about fast cars, women and the gifted, like the subject of one of his greatest hits, “Johnnie B. Goode.” The song’s lyrics said Johnnie B. Goode never learned to read or write so well, but he played the guitar like “ringing a bell.” In the song “Nadine,” she drove a coffee-colored Cadillac. During Berry’s long career, he was imprisoned twice for income tax evasion and a conviction for violating the Mann Act, which involved taking a 14-year-old girl across state lines for illicit purposes. The Mann Act also was used against heavyweight boxing champion Jack Johnson in 1912 and architect Frank Lloyd Wright in 1926. The charges were dropped against Wright but Johnson was convicted. 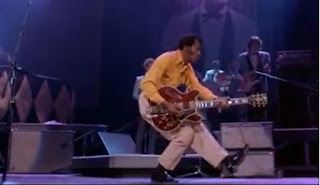 Charles Edward Anderson “Chuck” Berry was born October 18, 1926, in St. Louis. His parents were grandchildren of slaves. Martha Berry, his mother, was one of the few black women of her generation to gain a college education. His mother was a school principal, and his father, Henry Berry, was a contractor as well as a deacon at the Antioch Baptist Church. Chuck Berry was the fourth of six children born to the couple. He attended Sumner High School, a private institution that was the first all-black high school west of the Mississippi. For the school’s annual talent show, Berry sang Jay McShann’s “Confessin’ the Blues” while accompanied by a friend on the guitar. Although the school administration bristled at what they viewed as the song’s vulgar content, the performance was an enormous hit with the student body and sparked Berry’s interest in learning the guitar himself, according to his biography. after over 19 years in prison. It was just over a year ago, March 13th, 2016, when Darryl Hunt, 51, the innocent man Winston-Salem held deepest in its heart, was found dead in a pickup truck. After being exonerated 13 years earlier for a murder it took almost 20 years to prove he didn’t commit, Hunt, who was reportedly dying of cancer, and frustrated with the struggles he encountered after being released from prison, took his own life, police say. Those who knew Hunt say had he lived, had he continued to advocate for those falsely locked behind prison walls like he once was, he would have found no surprise in a recent report by the National Registry of Exonerations that showed in 2016, North Carolina had the fifth highest number of prison exonerations in the nation at eight (the state has had just 36 exonerations since 1943). And of those eight, six of them were African-American. The Hunt case fueled the movement in North Carolina years ago that put the state’s criminal justice system under even greater scrutiny than ever before, creating the environment that spawned the Innocence Commission, and the Racial Justice Act in 2009 (before a Republican-led legislature repealed in 2013). But civil rights attorney Irving Joyner, chair of the NC NAACP’s Legal Redress Committee, says the numbers show that more must be done now. “For decades, many North Carolina's prosecutors have used illegal means to obtain convictions against people who were innocent, poor and defenseless. The statistics show that most of these innocent victims were African Americans who did not have the resources to challenge their prosecutions and were prohibited by North Carolina law from obtaining vital information, prior to trial, which would have assisted in their defense of tainted charges and, as a result, defendants had to encounter "trials by ambush,"” Joyner, who also teaches at the NCCU School of Law in Durham, says. “Our criminal justice system is broken,” says Rev. William Barber, pres. of the NC NAACP, which is demanding the release of Dontae Sharpe of Greenville, whom they say was falsely convicted of a 1994 murder. “We need serious reform because incarceration of innocent people is criminal. If we are fifth highest in the nation, this begs the question how many others are innocent but incarcerated. In a continuing effort to force the Republican-led NC General Assembly to back-off, if not repeal various “extremist” laws and measures, the NC NAACP Tuesday rallied supporters from across the state at the Legislative Building in Raleigh, lobbying lawmakers to work with them, or else. The “or else,” according to Rev. William Barber, president of the NCNAACP, could be thousands of chapter members and supporters returning to Jones Street in a few weeks, and conducting a mass sit-in at each legislator’s office. “They’re really trying a political coup,” Rev. Barber told his gathering on the Halifax Mall behind Legislative Building, noting how laws are being considered to remove traditional powers from Democrat Gov. Roy Cooper; allow concealed guns on college campuses; and makes it illegal to be a whistleblower if employees see injustice or fraud. That’s considered nonviolent “direct action,” organizers say. But there are important steps, like educating lawmakers on the issues, and negotiating with them. Barber also stressed that before any direct action, there must be “self-purification” so that demonstrators are acting with righteous purpose, not their egos. Several weeks ago the NCNAACP, joined by national NAACP Pres. Cornell William Brooks, called for a national boycott of North Carolina if GOP lawmakers continued draw racially gerrymandered voting districts, and did not repeal HB2, the notorious “bathroom law” which not only targets members of the LGBT community, but also restricts municipalities’ ability to raise their minimum wage ordinances. The state NAACP also announced the filling of a bill that would call for special legislative elections to be held now because the current legislature is “unconstitutional.” The civil rights groups adds that because the Fourth Circuit US Court of Appeals ruled last year that because the 2011 legislative map was unconstitutional due to racially gerrymandered districts, then the legislature elected based on that map was unconstitutional. A federal court ruled that lawmakers were to redraw the map by March 15th, and have special elections planned beginning in September, however that ruling was appealed to the US Supreme Court, which has not ruled either for or against as of yet. There are also bills that the NCNAACP supports passage of, including HB303 – the Voter Freedom Act, which would protect North Carolina voters from being improperly challenged during the 25 days prior to an election; HB233 –the “Ban the Box” law which will help formerly incarcerated individuals qualify for employment without initially divulging their previous criminal history; and also HB13, which provides greater flexibility in class sizes and would prevent mass teacher layoffs in programs such as art, music, physical education and languages. [RALEIGH] If Pres. Donald Trump’s proposed budget is passed, millions of federal dollars for public television and radio stations in North Carolina will be cut, published reports say. The Corporation for Public Broadcasting received $445 million for the current fiscal year, with PBS and NPR stations in North Carolina getting at least $6 million each. That’s anywhere from seven to 22 percent of their individual operating budgets. Right now, there is a national campaign to urge Congress not to pass the president’s budget cuts for public broadcasting. [RALEIGH]If a new bill is passed, high school students statewide will no longer have to take state-sponsored final examinations in various subjects. A state House committee Tuesday approved eliminating final standardized testing for high school students, allowing teachers to develop their own final exams. Certain end-of-grade tests required by federal law would remain. [RALEIGH] Investigators are still mulling through the ash and debris left in the wake of an enormous fire last weekend that totally destroyed a five-story, $51 million apartment complex under construction in downtown Raleigh. Several surrounding buildings were damaged by the intense heat and flames. At press time, the cause of the fire had not been determined. There were only minor injuries reported, and no casualties. [RALEIGH] A freshman student at St. Augustine’s University was fatally shot late Monday in Washington, DC while making a music video with friends, authorities say. The victim was identified as 19-year-old Ayana McAllister. Reportedly, she was with friends making the video when shooting began, with at least one bullet fatally striking her in the crossfire, while another female was grazed. Ms. McAllister was a native of DC. Police are still investigating.